time: 8:30 a.m.; finish 2:20 p.m. The Day 6 program? Leaving the G’Bay coast and heading up north! 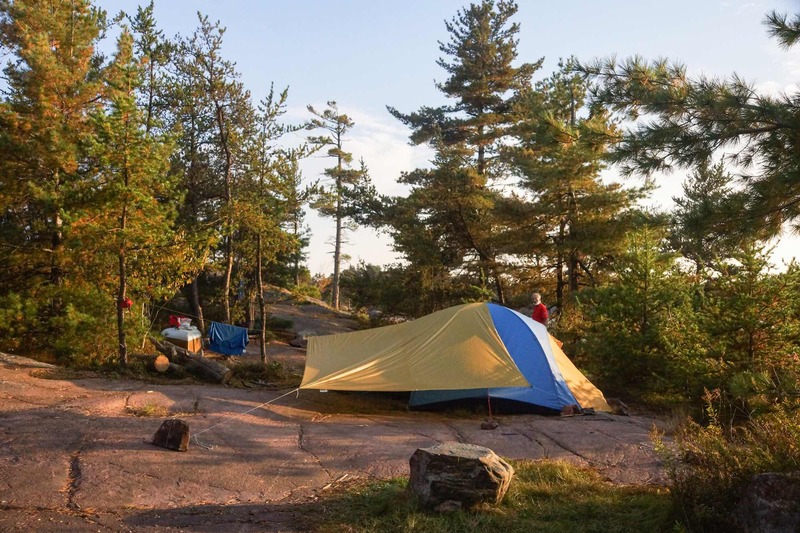 While we could easily have paddled out to the car, we decided to spend one more night in the park, going up the Pickerel River and finding a campsite in the Pickerel Bay area. There are several indicated on the official Park map. We liked the southern exposure of CS 633 and its location right on Pickerel Bay and figured it would be the likely spot. Time would tell! 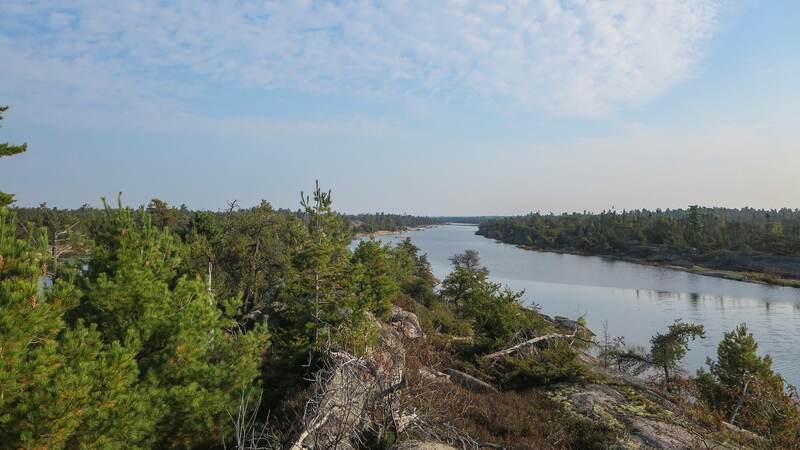 To no surprise, the trip up the Pickerel was more of the same totally scenic vistas that we had paddled into on the previous five days in the French River delta. I cannot remember a trip with as much of a “wow” factor as this one! 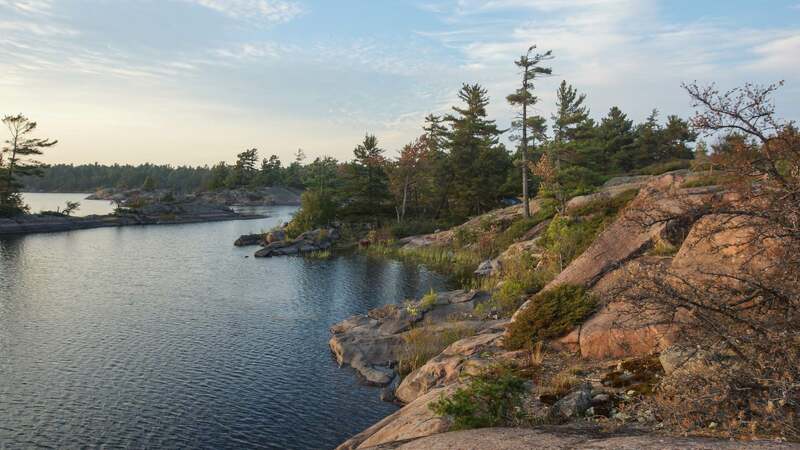 There was only one portage to do, a 150-meter scramble up and across a mostly rock outcrop with a bit of bush to dodge around. 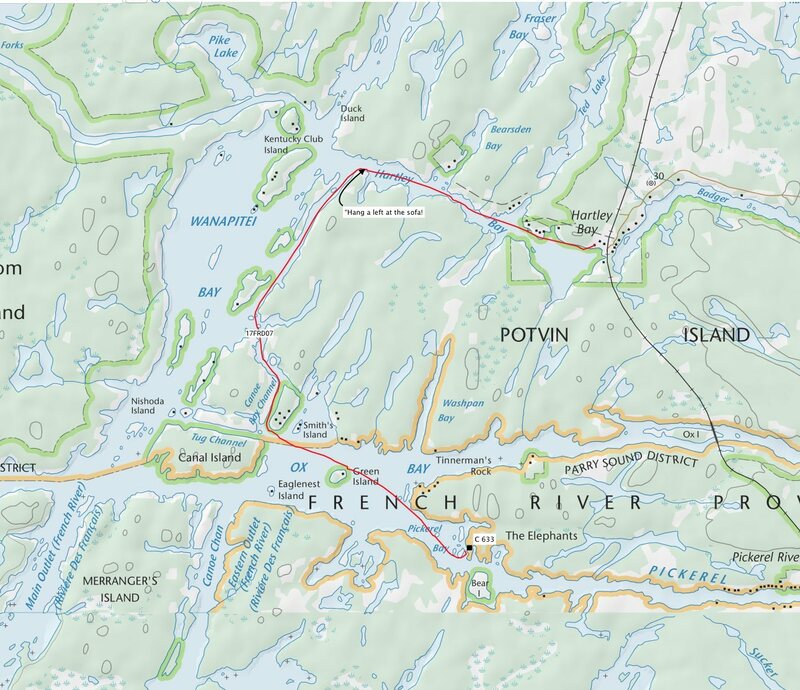 (The official park map has the portage at 90 meters.) We were unsure initially about where the trail was but think we got it right. After the carry we did go back and mark the beginning and end of the trail and gave the bush a bit of a trim. A two canoe/four person party – the first we had seen in days – came in just as we were finishing off. They landed below the hut and improvised their own trail across to the put-in. I remember thinking – “Well, so much for marking the trail more clearly!” We noticed that one of the other guys, did it in bare feet. Later we found out that the rest of his group had nicknamed him “Tarzan”! Just north of the portage we paddled through a narrow and reedy channel. The notation on the park map reads “low water, dry area” but we did not experience that. The two feet higher than before water levels help! 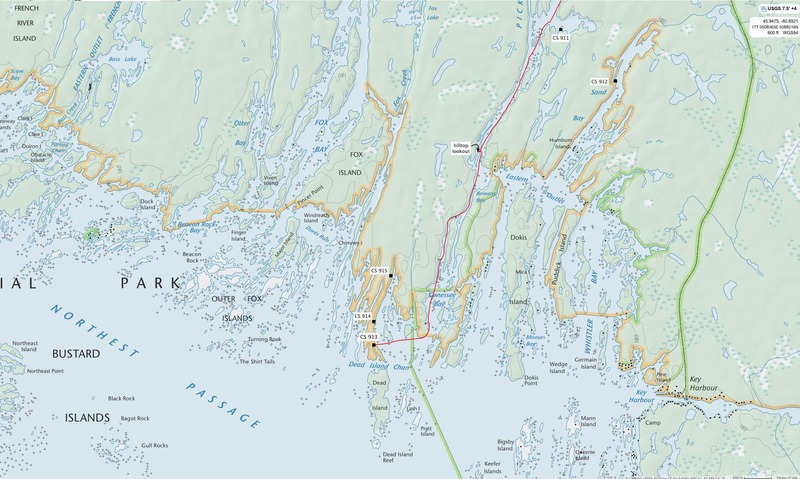 Even if it was a bit lower, the stretch is not all that long and a bit of walking the canoe up the channel would deal with it. 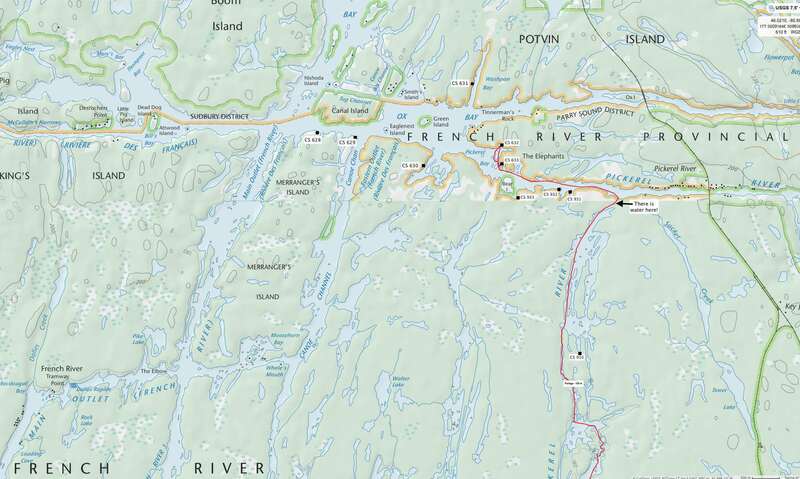 It is certainly not a reason to avoid coming up the Pickerel River from the Bay. When we got to CS 633 shortly after 2:00 p.m. we were ambivalent about the site. 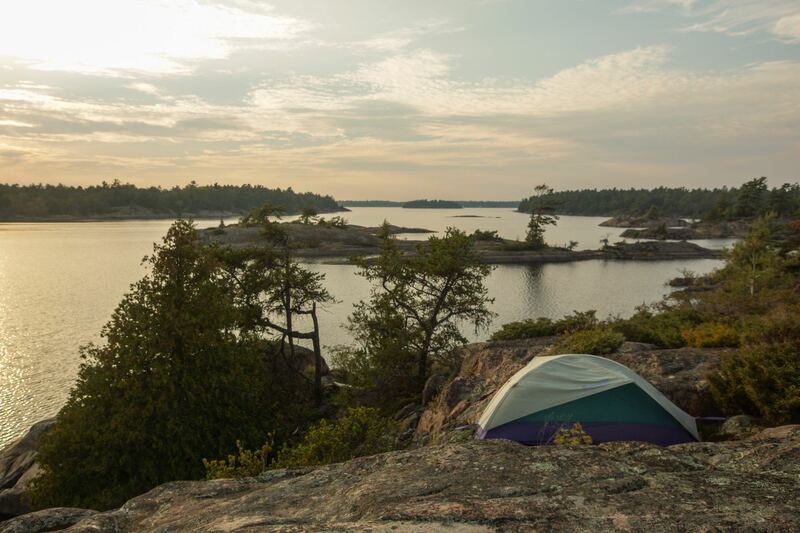 On the one hand, it had a stupendous view of Pickerel Bay thanks to the 10-meter high rock outcrop that had a few campsites on top, as well as a few closer to the landing area down below. However, we were not convinced that any of them would be a good choice in a possible storm; we were especially concerned about water streaming under our tent thanks to the slope of the various possible spots. We decided to check CS 632 tucked inside the bay just 100 meters to the north to see if there was anything better. We did. 632 is a dud! Back to CS 633 we headed and decided to make do with an imperfect spot at the bottom of the rock face. During the night it did rain but only briefly; We found a bit of moisture under one side of the ground sheet when we put away the tent in the morning. For a couple of them it was a repeat visit and they already knew CS 633 having camped there last year. They also had smaller tents and seemed to be less fussy than we can be. 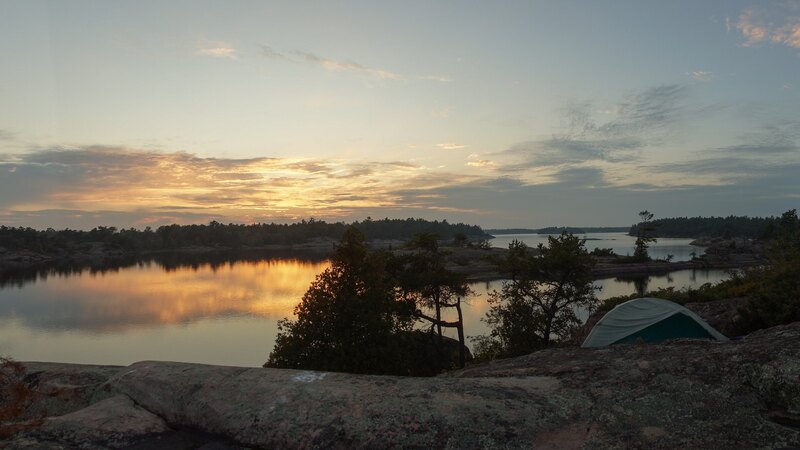 Soon their three tents were up and six people got to enjoy the sunset from the top of CS 633, definitely one of the top 3 campsites of our six days out in the French River delta. The other two just as nice sites? the one at Eagle Nest Point on Day 3. And, for the record, the remaining three sites in declining order were CS 913, CS 723, and CS 624. 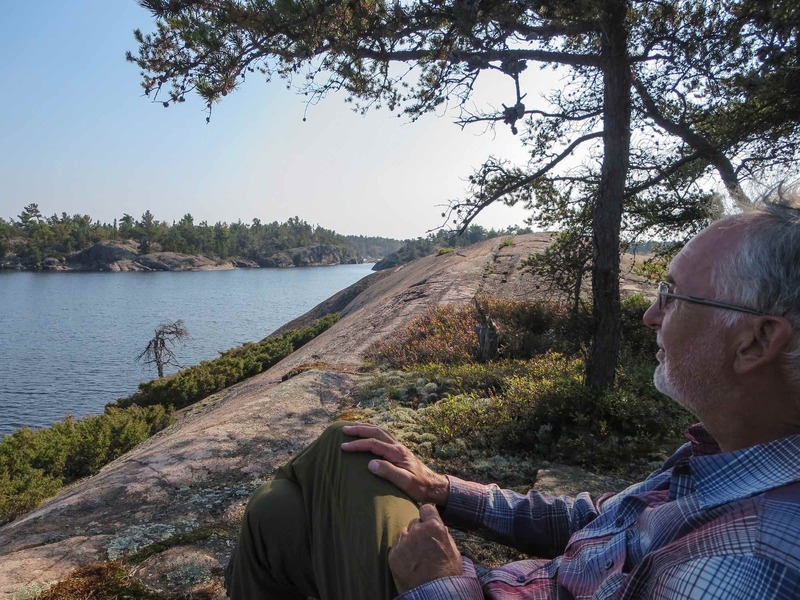 As we sat up there on top of the rock with our cameras and our double shot of maple whiskey, we agreed that the trip had turned out even better than expected and talked about a return visit. 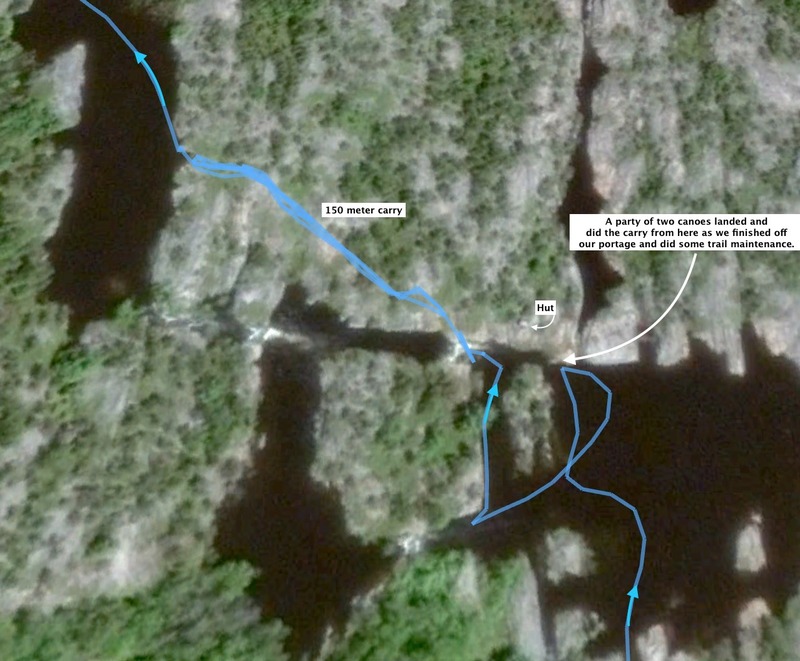 There were still more channels to paddle up and down and other great campsites to discover. 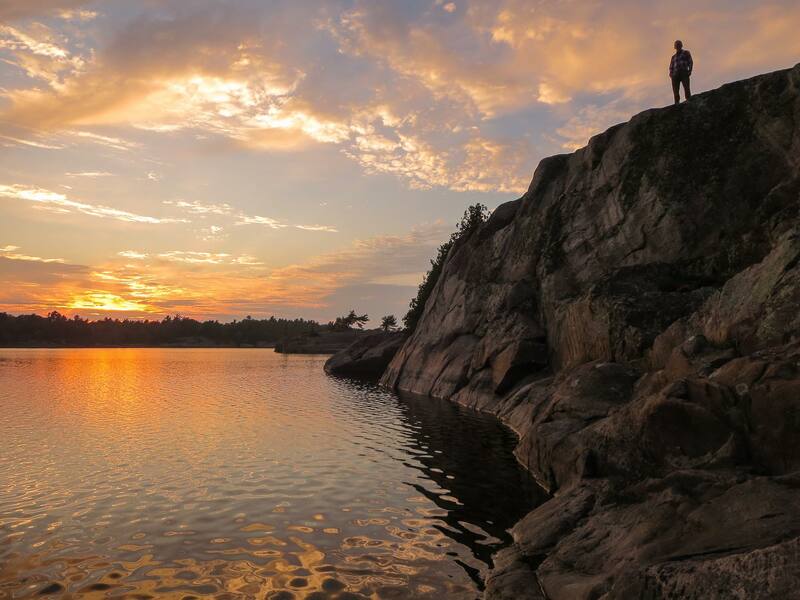 Late May or June, September or early October – all we’d need is the exceptional weather we had for the past week! 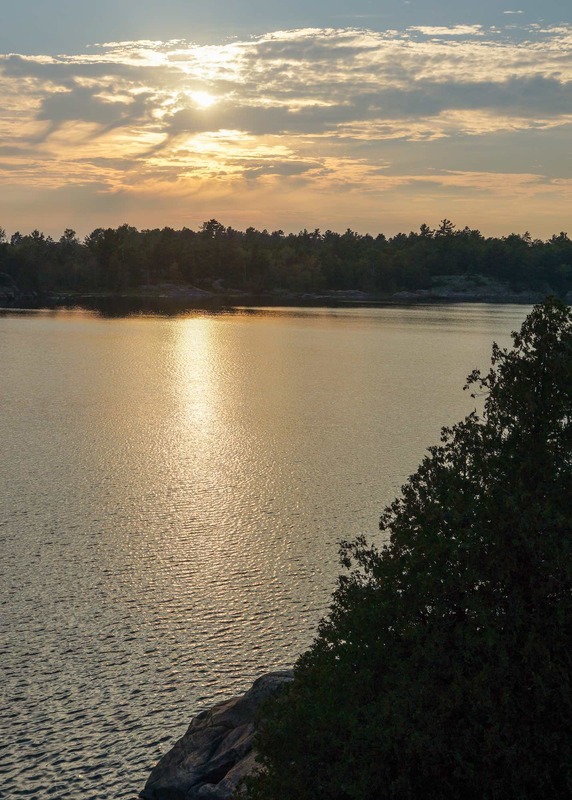 And the best thing – it is all so close to Toronto – and yet a world away! 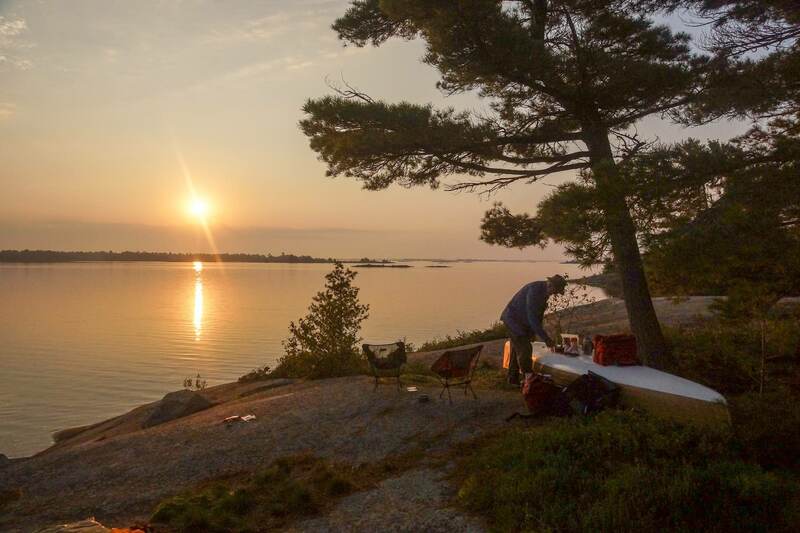 This entry was posted in Georgian Bay, wilderness canoe tripping. Bookmark the permalink.